Biography is difficult. It’s tough to fit a life history and useful insight into the subject’s character into 90-odd minutes, and too often films about creatives are simply too long. Loving Vincent neatly solves this problem by wrapping the storytelling around van Gogh’s work itself, capturing both very neatly, and then turning the whole result into a living, breathing painting, put together by a hundred artists working over two years to create 65,000 frames. It took directors Dorota Kobiela and Hugh Welchman four years of development just to figure out how to make that work, but it really paid off. Van Gogh is famous for his character flaws, and the film uses and deals with them all to great effect. It cleverly dispenses with the ear thing REALLY early, and gets a few laughs out of it too, neatly avoiding the potential distraction. Aside from the utterly unconventional presentation, the film is essentially neo-Noir, framing the storytelling through the eyes of a close friend’s son, Armand Roulin (Douglas Booth). Roulin spends the film trying to figure out whether, how, and why van Gogh killed himself, with an epistolary approach in place of a Noir voiceover. This is another clever use of a biographical element – van Gogh is famous for his prolific letter-writing- and it really gives Roulin as the son of van Gogh’s postman the right voice. The film convinces you the layered approach is going to work very early, with a casual conversation about making coffee during an establishing scene providing a neat opportunity to cut away to a still life with coffeepot – which is then picked up and poured for Roulin. 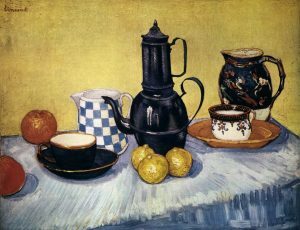 This is the first of many chats over coffee, wine, or cider, with different characters in a series of vignettes, and Roulin – as you would expect in a Noir – learns something new in each of them, and the viewer learns something different about how van Gogh was seen by everyday people. The vignettes from a range of well-cast actors really work, with a standout performance from Saoirse Ronan driving the last act, and Jerome Flynn as Dr Gachet providing a compelling climax. John Sessions plays John Sessions as well as he always does. It’s down to the characters outside of the vignettes to pull the whole thing together, and they more or less do, with a brilliant performance from Helen McClory as Dr Gachet’s housekeeper, and a strong if oddly theatrical performance from Eleanor Tomlinson as her nemesis (Maybe the mild nibbling on the scenery was a directorial choice – it brings light into the film and it’s not too far wide of Hepburn’s flower girl in My Fair Lady.) The boatman (Aidan Turner) and the postman himself (Chris O’Dowd) provide a conscience. Turner is competent and O’Dowd is excellent, helped by an entertaining transformation into a more hirsute version of himself, strangely reminiscent of Yellow Submarine’s Ringo. The plot includes plenty of did-he-didn’t-he elements and never seems laboured, although some of the dialogue is a little clunky – but never in the key scenes. The best example of just how well the structure works is the final sequence, which begins with Roulin walking into one of van Gogh’s better known portraits, sitting down at the table, and striking up a conversation with the portrait’s subject. The soundtrack from Clint Mansell perfectly matches van Gogh’s visual quirks. That’s another example of how the team have made careful production choices to make this work as a package and it really, really does. Watch it – and make sure you stay for the credits. 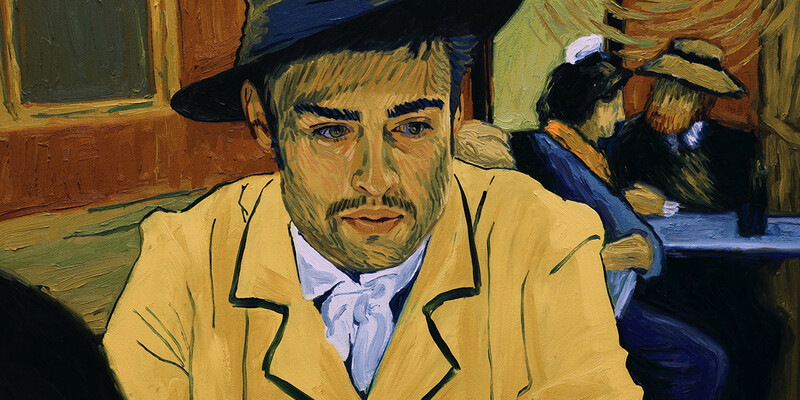 Loving Vincent is sold out at the London Film Festival and is on general release in the UK from Friday 13th October.